almost entirely Penneys/Primark. What I love about this outfit is that it looks so chic and expensive - but really, it wasn't! 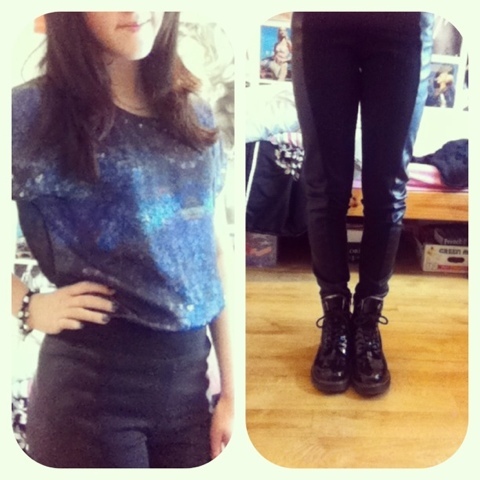 My Dr. Martens are my new babies by the way (ok I own up, they're actually fake..). They're so comfortable, and lined with faux sheepskin inside which really adds to the wearability factor. I bought them at a street market, believe it or not. The blouse has a waterfall effect, so it's long at the back and just above thigh let at the front. Its really light and see through at the back, so I wore a black tank top underneath. The best part? It was €5 on sale! (Penneys best!) I was so proud with this bargain as it can be worn in numerous different ways. The leather panelled leggings are AGAIN from my favorite bargain hunting shop, and I paid around €10 for these. I picked these up when having a snoop around in the sales (which weren't even that good this year apart from these purchases). I was actually going ice-skating the day I wore this outfit so I threw on a black chunky knitted cardigan and a purple leather jacket, customised by moi with some silver studs I snapped up on eBay. And you have a lovely blog, maybe we could follow each other? thank you, sure, I just followed!